Basecamp is a great collaboration tool but it does not natively support resource forecasting and time tracking. Roadmap supports two methods that allow users to manage the inputs required to forecast resources and track time . . . all without having to leave Basecamp. Users should avoid using both methods simultaneously for the same project. The browser extension is seamless and goes beyond forecasting by also supporting time tracking. Watch the summary video below or start to enable for your account right now. The bracket method works, but it is older and not recommended. MM for January must be " 01"
DD for the third day of the month must be "03"
Enable start dates and estimates sync by selecting Yes (D). Enter the start date at the beginning of the to-do description (or milestone if you use Basecamp Classic) and the estimate at the end of the description. Both entries must be enclosed in brackets with no extra spaces. Changes made to the Start Date or Planned Effort fields in Roadmap or Basecamp will update the other system upon the next import/export cycle. Important: Because Roadmap is considered the system of record for Start Date and Planned Effort, deleting those fields in Basecamp will not delete them in Roadmap. For example, if you delete the start date in Basecamp, Roadmap will reinsert it during the next export to Basecamp. Therefore, to delete those fields, you must delete in Basecamp first then in Roadmap. Alternatively, for Planned Effort field, you can change to "[0h]" which will effectively delete it in Roadmap. Multiple resources assigned in Roadmap. Roadmap supports assigning multiple resources to a single work item. If there are multiple assigned resources, time estimates entered into Basecamp will assign the estimate to the responsible party. To evenly distribute the time estimate across all assigned resources, go to Connecting Applications > Basecamp. 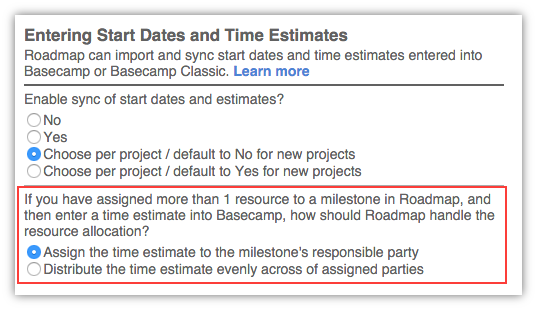 To enable sync start dates and estimates for all new Basecamp projects going forward, go to Connecting Applications > Basecamp and select "Yes" for "Sync start dates and estimates for all newly imported or created projects". Estimates must have the bracket-number-unit-bracket structure with no spaces. For example, [4 d] will not be recognized. Estimate unit is limited to one character. For example [4days] will not be recognized. If there are multiple instances of start dates or estimates found in a single description field, Roadmap will only use the first one found. The lowest acceptable value for an estimate is 2 decimals points. For example, if you enter 5.259 Roadmap will only recognize 5.25.